This epic Dreamworks Production called 'Madagascar' takes us on a wild adventure. This epic Dreamworks Production called 'Madagascar' takes us on a wild adventure. When I say wild, I mean WILD! Marty the Zebra (Chris Rock) is bored of being in New York Central Zoo and wants to get out in the wild. It is Marty's Birthday and wants a real treat instead of a snow globe! He gets this idea when the Penguins give him advice. Whilst Marty is planning all of this the other 3 have no idea. The other 3 are, Alex the Lion (Ben Stiller) is king of the Zoo. He is the animal everybody wants to see! We want to see his big roar and show us all what he is made of. Next is Gloria the Hippo (Jada Pinkett Smith) who just likes to be lazy. She likes to relax in her pool and get on with her private life. Finally there is Melman the Giraffe (David Schwimmer). Melman is crazy and is really paranoid. But he secretly has a crush on Gloria. On Marty's Birthday night Marty escapes from the zoo. We realize this when Melman wakes up Alex to say he was gone! Where has he gone? Alex, Gloria and Melman all panic about where Marty is. In my opinion without Melman realizing Marty was gone the film would not have gone the same way. Well done Melman for realizing! The big question is, WHERE IS MARTY? We see a front shot of Marty strolling through New York and is heading for Grand Central Station. The other 3 knew exactly where to look as Marty had told them he wants to go to the wild. They were not happy about it. Alex, Melman and Gloria rush over to Grand Central to stop Marty. Things don't go to plan when the police soon turn up and put the animals to sleep. This is really where the adventure begins. We see a dark shot now with a pair of eyes. This is obviously signifying that this character is in a dark place. Who is this character? It is Alex. Once the room lightens up we see that he is in a box yes a BOX! We then see that the other 3 are all in a box as well. Why are they in a box? These 4 animals are on their way to Africa. Well they don't quite make it to Africa. Once an argument breaks out between Alex and Marty things get violent. They begin to shake the crates/box and the straps come loose. All the boxes end up in the sea as they are on a boat to Africa. All 4 boxes go separate ways. Funnily enough all the boxes fond their way to the same beach! Well that's good! At least we know they are all safe. If the boxes didn't re-unite with each other the film would have not worked. Then this review would stop here. LUCKILY the film carries on and so can the review. All 4 of them try and work out where they are. Alex begins to shush everybody as he hears something. What is it? Is it a bird, is it a plane? No it is music. Music did I say? Yes music! The gang begin to follow the music and end up in a huge amount of Lemurs! There is a King of Lemurs. A very potty King Lemur. His name is Julian (Sacha Baron Cohen). 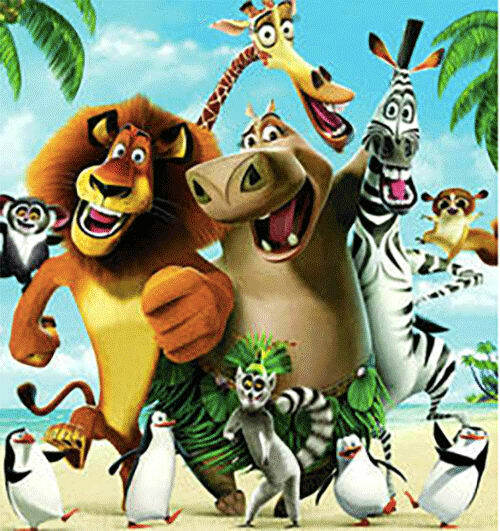 This part of the film becomes very unique when the Lemurs have a disco party. Music and flashing lights everywhere. You don't see a normal bunch of Lemurs doing this do you? Of course not, don't be so silly Lewis come on! Anyway things become serious when the party is crashed by the mighty Fossa. The Fossa want to eat the Lemurs. Again you don't see Fossa eating Lemurs half way through a disco party do you? When the boat is in visibility which is being controlled by the Penguins! Yes the Penguins! The boat head towards the beach quite quickly. Marty does not want to leave without Alex. Marty dashes off looking for Alex. Now that is a good friendship! Once the fights and distractions are over we come to a happy ending. The 4 animals all hope to go home. But the Penguins don't tell them that the boat is out of gas!! Looks like they are stuck in the wild. Alex is happy with it! Do they stay there? 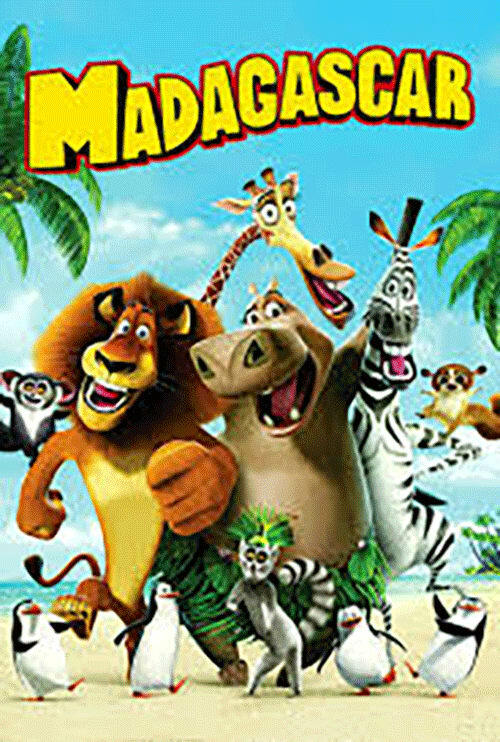 Well you will have to watch 'Madagascar 2 - Escape Africa'. So overall I think this film has key themes to it like friendship, happiness and sadness. We all go through bad times which is normal. Everyone does it. Well done Dreamworks!! Film Industries and Creative Writing student at the University of Portsmouth.